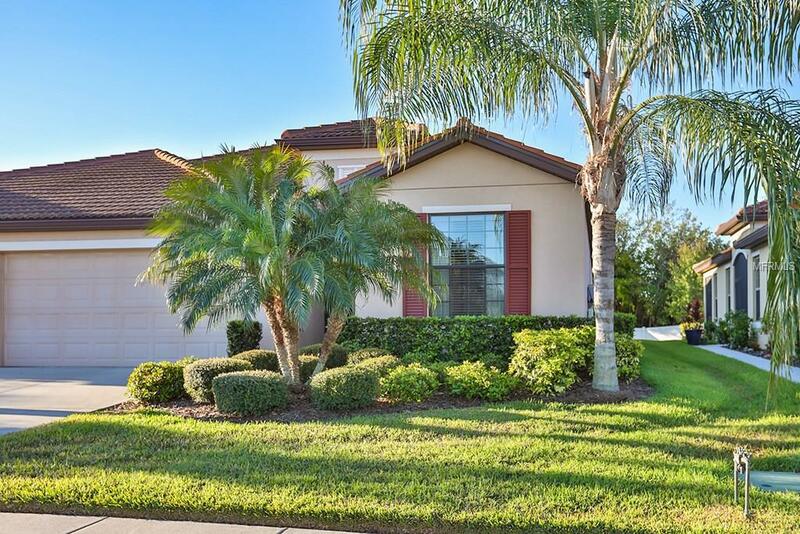 This exquisitely decorated home is the perfect home for a couple or single person in the most affordable Del Webb 55+ community in the Tampa Bay area. With ceramic tile floors, crown molding and over-sized baseboards throughout the living areas, this home exudes sophistication. The granite counter tops in the kitchen and granite-topped custom cabinetry in the master bath demonstrate additional quality. The screened front entry porch and the screened rear lanai (both with ceramic tile flooring), provide an opportunity for cross ventilation and fresh air, when the weather permits. In addition, to all the features of the home, Southshore Falls boasts a 14,000 sq ft clubhouse, with 3 pools, state-of-art fitness center, billiards room, library/card room, craft room, internet cafe and ballroom. Additional amenities include: Bocce courts, tennis courts, pickleball courts, a satellite pool facility and two parks, together with over 4 miles of walking and jogging paths. A 24/7 guarded, gated entrance and full landscape/irrigation maintenance are all included for only $260/month for the HOA fee and no CDD! Pet Restrictions See Hoa Docs For Reasonable Restrictions.